As a relatively new financial tool, the reverse mortgage option is being exercised by an unprecedented number of retirement age seniors. Anticipating a flood of retiring baby-boomers, the government has taken an active role in establishing specific rules and guidelines for this type of loan. 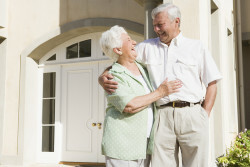 The Federal Housing Administration is behind the modern reverse mortgage. The FHA doesn’t itself make the loans, instead it insures reverse mortgage lenders against any loses on loans known as Home Equity Conversion Mortgages, or HECMs. For borrowers, this insurance guarantees that they will receive the expected loan advances. Reverse mortgage lenders are held to strict rules that protect both lender and borrower. While a reverse mortgage isn’t the best choice for everyone, to more and more seniors with equity in their homes, the reverse mortgage option proves instrumental in maintaining a comfortable, independent and stress-free retirement. Call Lineage Lending today to find out more.